The Voodoo-1 has been designed and optimised to suit a wide range of pickups. It is the best choice for humbucking pickups and produces bright clear tone colours that will make solos stand out without sounding too thin. Using single coil pickups and 4 x 12 cabinets it gives the addition body with bite that is necessary to cut through. The Voodoo-1, of course is equally happy with combos at low volume and make these small amps sound like big stacks. The distortion produced feels particularly tube like in operation and the Voodoo-1 slips into distortion with silky smoothness and compression characteristics usually only associated with vintage classic tube amplifiers The volume control of the guitar is very effective in controlling the amount of distortion and the guitar cleans up to it's original tone very easily. The TONE CONTROL is of advanced design and has been optimised to compliment various pickup types. The GAIN CONTROL enables the unit to be used as a power booster without distortion up to full maxed out grunge grooviness. The OUTPUT CONTROL sets the amount of boost required. Electronically the Voodoo-1 shares all the same basic Voodoo Series features with dual output buffering or hard wire output etc. The distortion section uses a unique combination of the best discrete and IC design techniques to emulate the type of distortion found on many classic tube amplifiers. It allows the player to create a wide range of distortion effects from mild to extreme whilst reacting to the most subtle nuances in touch and playing. The Voodoo-1 is housed in our Classic Style enclosure with both dual direct drive buffered outputs or hard wire output and has provision for an internal 9-Volt Battery (battery life 150Hrs) or can be powered from a 9-Volt DC Power Adapter (not supplied). Extensive internal filtering ensures that noise free operation is maintained even with the most basic of adapters. This feature feature is standard on all our voodoo series and in effect reduces the output lead length to zero. This results in GREATER DETAIL and FIDELITY than using two long lengths of guitar leads in traditional hard wire bypass set-ups. The problem of CABLE NOISE induced by vibration on stage is eliminated together with electrical magnetic interference induced into shielded cables from lighting rigs etc. Possibly of more importance there is no TONE SUCKING at all from the output length of guitar cable. After all the ULTIMATE GUITAR CABLE would have a lead length of zero, and guitar players can detect the difference between long and short cables easily. The overall signal quality in the unit is thus guaranteed right up to amplifier and this overall performance exceeds any other method in use today. 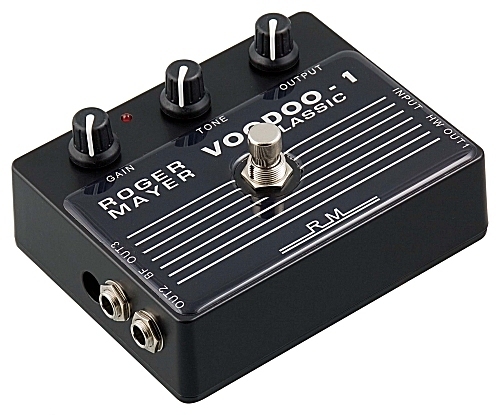 When using a Voodoo 1 as the last device in a signal chain the distance to the amp does not come into consideration and long leads can be used successfully in recording situations e.g. : playing in the control room. The Voodoo-1 has a true hard wire output plus two buffered outputs that can drive long cable lengths with no high frequency loss. These buffered outputs are disconnected when the hard wire output is being used. This means that all performance situations are catered for whether you want a true hard wire output or your situation calls for the advantages of buffered outputs.